Thank you for your interest in Typeset for Universities. Our team will get in touch, shortly! One simplified tool for researchers to write, collaborate and format research papers. Productive writing tool and integrations enable researchers to reach their publishing goals faster and better. Typeset is known to reduce time spent on writing papers by 8 times. Researchers get instant access with dedicated single sign-on(SSO) portals. Administrators get records of institutional publications and analytics. Submission, review and publication of institutional research takes weeks of manual effort and money in coordinating reviews and formatting for compliance. Typeset automates 70% of the process. 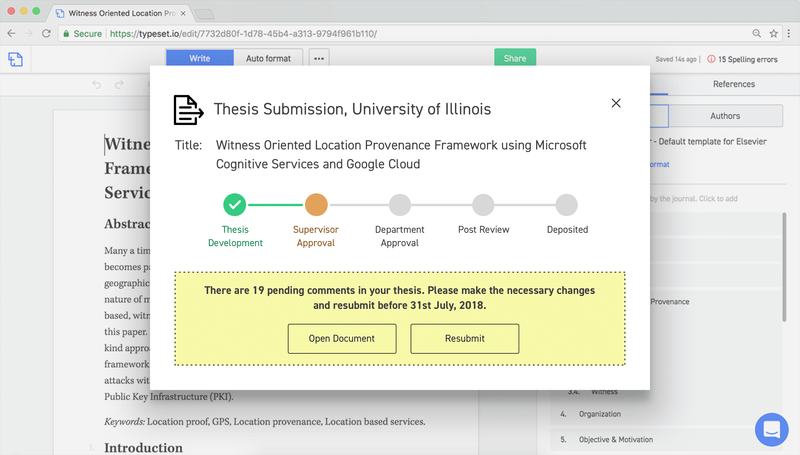 It provides workflows to simplify thesis and dissertation development, department approval, college approval and submission process. Scholars, supervisors, reviewers and staff use the same platform to collaborate effectively. All outputs are 100% compliant as per university guidelines ready to be archived. 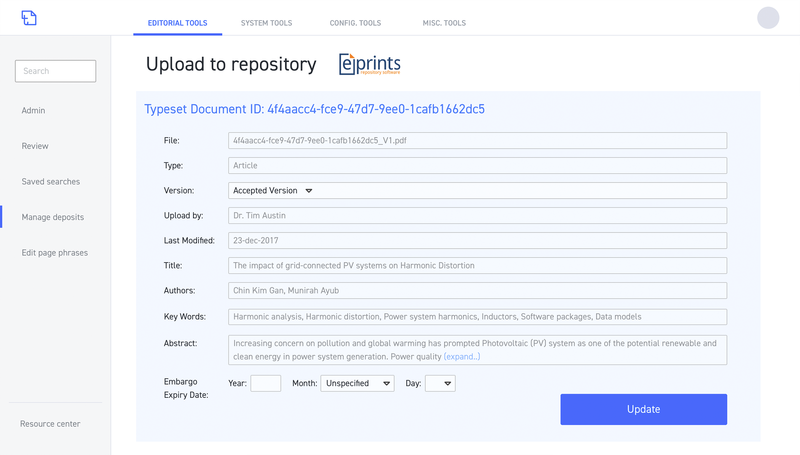 With Typeset, Scholarly Communications Librarians can enable direct submission to institutional repositories, open-access repositories and preprint servers with relevant metadata in a single click. Different universities are at different stages in adopting open access policies with their publications. Typeset allows you to customize archival process in accordance with institutional open-access policies and funder mandates to ensure 100% compliance. Assessing publication activities of internal and external faculties have typically been time-consuming, involving the manual entry of data into different systems. 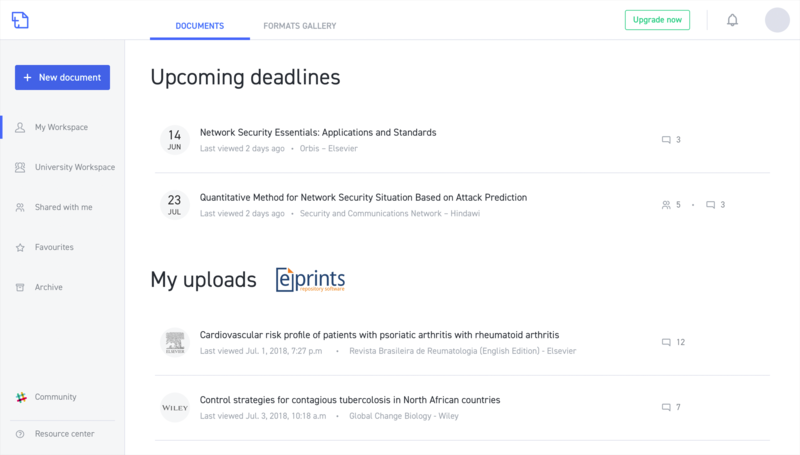 With Typeset administrators get a real-time data on ongoing and publisher research work. 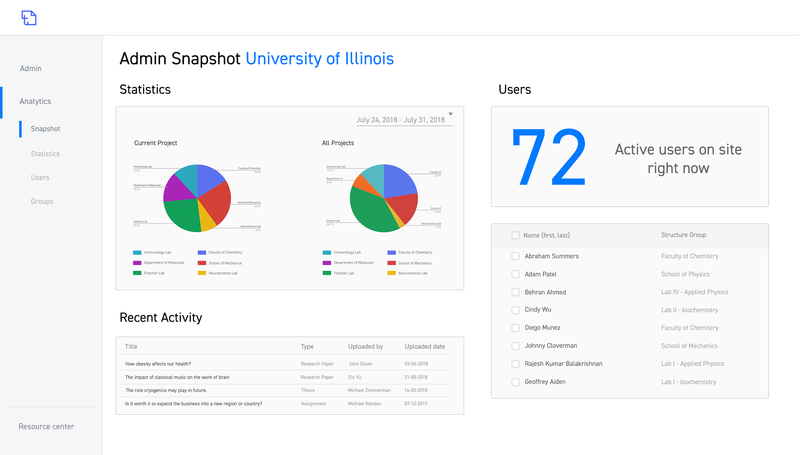 Customized administration rights allow management to view usage statistics, check file before they are made public and control permission and access rights. Your tool is awesome! I am writing a paper for a Wiley journal, it is my first time after several IEEE papers, and you tool is a life saver! I couldn't find any template or exact instructions beside the script and the size, so it is super useful right now, when I don't have to waste time left to manually search and format. Research publication has become more complex job than research activity. Most of the time my users find problem with formatting their research publications. Typeset plays very important role in increasing research publication. I must tell you it's wonderful product. I am so grateful to find an easy-to-use manuscript formatting program. It's safe to say that after all the work a scientist puts into research and writing the article, it's formatting is such a dreaded task. It used to take up so much valuable time, me and my colleagues finally have a solution! Contact us today to secure a Typeset demonstration, and see how it can revolutionize your institution’s research. 1. What is the price of Typeset for institutions based on? The price depends on the research intensity and number of users at the institution, get in touch for a tailored quote. 2. How can I get Typeset for my institution? After you fill out the from, our partnerships experts will reach out to you and understand your research needs. After that we give a online/on-campus demo to relevant decision makers. 3. Can Typeset integrate with our institutional repository? All research articles on Typeset can be archived to any institutional repository eg. Dspace, Eprints, Fedora etc. 4. Do you support custom metadata? Yes, you are able to add custom metadata fields at an institutional or department level for custom templates built for your University. 5. Can the institution customize and brand the Typeset portal? Yes, there are elements of the Typeset university login domain you can tailor to your institution's brand. 6. How secure is Typeset? Protecting your research content on Typeset is our first priority. Typeset uses physical, procedural and technical safeguards to preserve the integrity and security of your information. We regularly back up your data to prevent data loss and aid in recovery. Additionally, we host data in secure SSAE16 / SOC1 certified data centers, implement firewalls and access restrictions on our servers to better protect your information. Your content can be accessed by only you at any point of time.